Nugget horseshoes in a jacket design. 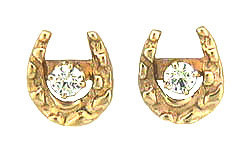 Here we have a nugget shaped horseshoe offering accommodations for any stud you may desire. Jackets dress up any stones you have for the big show. NOTE: Studs are sold seperately!